Paquera, Cobano, Panica and Vainilla. We help the community is a program that Century 21 Beach Area Properties real estate has provided since 2003. We are helping the community with contributions up to $50,000 each year. This money is being invested in different ways every year. We contribute to schools, recreational organizations, churches and the poor and ill people who don’t have any resources for aid. Each month we spend a certain budget on different projects and people that require help. Beach Area Properties also helps with construction of community buildings. This year we are helping to finish the church in Tambor. At this moment the old church is in very bad shape and a new church is being built next to the old one. Every year at Christmas time we purchase presents for all children in this area and deliver these to their homes each 25th of December. If you would be interested in helping our community as well, you can contact our office for information on contributing to worthwhile projects to improve the life of all who live in the Nicoya Peninsula of Costa Rica. 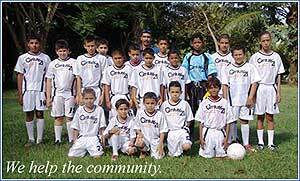 Century 21 Beach Area Properties real estate in Costa Rica has done many things in the past to give back to the community. Carlo Kohlinger owner of Beach Area Properties in Playa Tambor has this to say; “This is a program that we firmly believe in and we will continue with our efforts to improve the quality of life in the nearby towns where we all work and live”. Whether it be the donation of a property to build the football field in Vanilla, the construction of the football field in Panica along with the community center in Vanilla, money to help with the construction of the Catholic Church in Tambor, shirts for a local football team, or just to help with the maintenance of Police Cars, “Our organization realizes the importance of community, with over 65 full time employees not including affiliates in our organization in Playa Tambor alone, we not only work here in the community, we are part of the community”. Other real estate organizations advertise what they do for the local towns in an attempt to sell more real estate; we do things in a more private way. “The people that live here know who we are and what we do, this is just one of the reasons we have such a strong organization”.